Compared to original Xbox One release, the Kinect and voice controls has been redone to be playable completely with mouse only and all original DLC is now unlockable within base game. Demo available at the official site. Special costume set -12 Beers- DLC. Four postcards and two wallpapers. 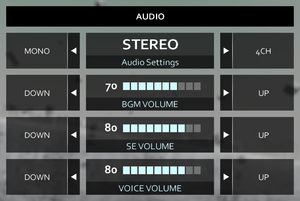 Humble Edition Soundtrack, which different from Mini soundtrack. DRM-free version of the game along with Steam key for regular version of the game. All the DLC that were released with Xbox One version is unlockable from the game for free. However there's optional DLC which unlocks them directly same way they would on Xbox One version. Humble Store offers DRM-free DLC, but their compatibility with other versions, such as GOG.com version, is unknown. Do not touch Nowloading.bik. Even though file is part of the intro, it's used as part of initial loading and it will automatically skip when game files has been loaded. 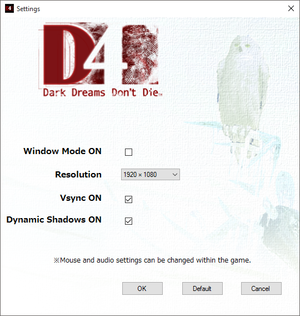 For demo version, look under D4 Dark Dreams Don't Die DEMO. Frame rate is capped at 62 FPS; See High frame rate. Natively supports up to 1920x1200 only. Go to the installation folder and backup existing D4.exe. Move the downloaded D4.exe into the installation folder. Everything is done with mouse or controller. 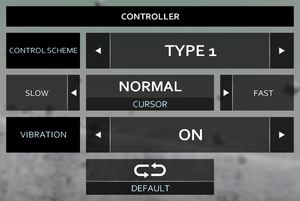 Buttons like Esc and ↵ Enter are useable in menus. Two presets, told in manual. Mono, stereo, 4ch, 5.1 and 7.1. Visually seems like really tiny draw distance or flickering. ↑ 2.0 2.1 File/folder structure within this directory reflects the path(s) listed for Windows and/or Steam game data (use Wine regedit to access Windows registry paths). Games with Steam Cloud support may store data in ~/.steam/steam/userdata/<user-id>/358090/ in addition to or instead of this directory. The app ID (358090) may differ in some cases. Treat backslashes as forward slashes. See the glossary page for details. 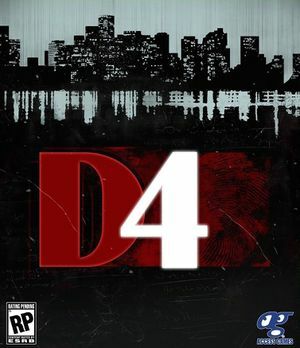 ↑ D4: Dark Dreams Don't Die - Season One - Humble Deluxe Edition :: D4: Dark Dreams Don't Die General Discussion - last accessed on December 27, 2015, Post #10. 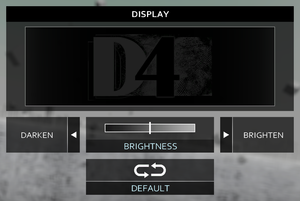 ↑ <path-to-game>\D4_GameHelp_EN.pdf, "Touch panel controls are compatible with Version 1.4 and later." 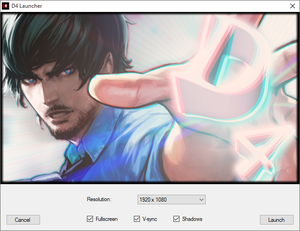 ↑ NeoGAF - View Single Post - D4 PC - last accessed on December 27, 2015, Post #180.